The TickTalk is the best kids wrist phone in the US market because we designed the interface and the APP in California for US market. 1. 12-HOUR REGULAR TIME: The new TickTalk 1.0S is upgraded the time to 12-hour regular time instead of military time. 2. VOICE MESSAGES: A private chat room for you and your child. 4. HISTORY TRACKER: In case of an emergency, the parents can playback the track history on the phone to be able to trace their child. 5. FIREWALL: When the TickTalk firewall is ON, TickTalk can make or receive phone calls from the preset contacts ONLY. 6. BETTER PAY AS YOU GO PLAN: The TickTalk comes with a free GSM SIM Card and PRELOADED WITH $5, no contract, it runs on T-mobile network. Follow the Sim Card Activation Instruction to activate the Sim and you already have $5 preloaded in the Sim. Please remember to REFILL before your current plan expires. 7. CHEAPER MONTHLY PLAN FOR T-MOBILE USERS: You can add a new line to your family plan in T-MOBILE if you are a T-Mobile user. You may get better deal. Please take note any WEARABLE or TABLET PLAN is not compatible with the TickTalk. You need a regular cell phone plan with at least 100MB data. 8. SERVICE: We are the original manufacturer and located in California, so we can solve any problem once having your call and email. 4.COMPATIBILITY: The App is compatible with all iPhones and Android cell phones. The watch runs on 2G GSM network ONLY. It's compatible with T-mobile, SpeedTalk, US Mobile, Ultra Mobile and Airtime. AT&T, Verizon or Sprint are not compatible. 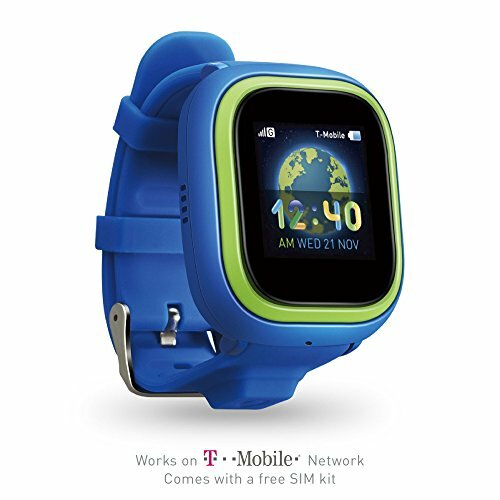 For AT&T, Verizon and Sprint user, you can use the SpeedTalk SIM came with the watch. It's a pay as you go plan, we recommend a $9 monthly plan which is good to go.